Luv the clash. Dislike the outcome. I would've been happier if he put Ba Nan Ji out of commission. All I see is Ou Sen’s in charge (A Kou) making poor judgment calls without any real consideration. Contrary to how I feel about this unprecedented exchange a certain someone deserves adequate praise. I’d like to know a little more about A Kou maybe a backstory. But what of Ba Nan Ji and Gyou’un don't they still have the upper hand and momentum. They could continue to obliterate A Kou's remaining army (what's left of it anyway) hereby improving their odds of winning this whole thing before Ou Hon takes over. 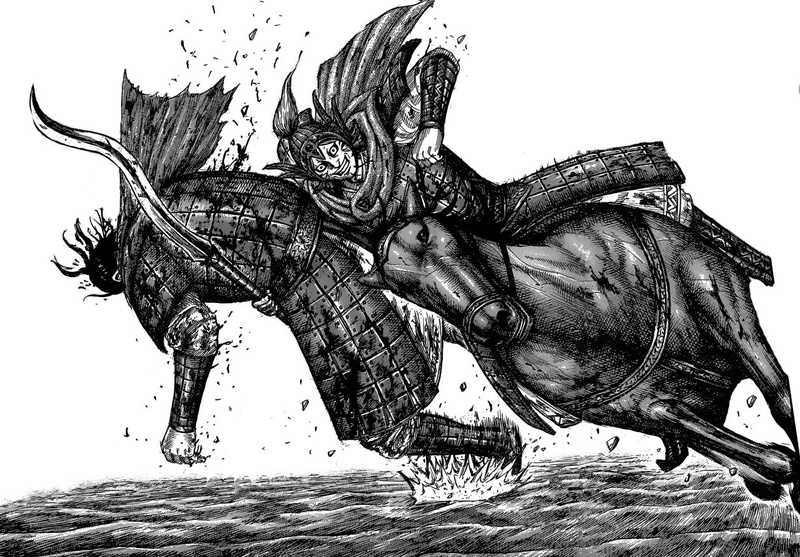 Ch.559 Pg.18 A Ka Kin, the only soldier whose horse can defy gravity. Someone give this man and his horse a promotion.